Protein and virus crystals, many of which were grown on the U.S. space shuttle or Russian Mir space station. The crystals range in size from a few hundred microns along their edge to more than a millimeter. Crystals grown in microgravity environments can grow larger and purer than crystals on Earth, making it easier for scientists to analyze their underlying components. Space is a dangerous place for humans: Microgravity sets our fluids wandering and weakens muscles, radiation tears through DNA and the harsh vacuum outside is an ever-present threat. But for materials that show incredible strength, transmit information with barely any loss, form enormous crystals or even grow into organs, the harshness of space can be the perfect construction zone. "We generally make things by subjecting them to a different environment," said Andrew Rush, president and CEO of Made In Space, an in-space manufacturing company. "We make food by cooking it in fire, heating it up and causing chemical reactions. We make steel by heating things up at high temperature and maybe, depending on the steel, [in a] high-pressure environment. We can quench things; we can make things cold to make different materials or improve on those materials. "Really, space-enabled materials are just another version of that, but instead of throwing something in a furnace and heating it to 1,000 degrees Fahrenheit [540 degrees Celsius] or something, we take it to space," he told Space.com. In space, microgravity lets materials grow without encountering walls, and it allows them to mix evenly and hold together without traditional supports. And a nearby ultrahigh vacuum helps things form without impurities. ZBLAN fibers processed on the ground have a tree-bark-like structure on the outside, whereas ZBLAN made in space doesn't show crystallization. The International Space Station is falling at a constant rate around the Earth, which everyone on board experiences as a lack of gravity; on the station, you're always in free fall. That environment, called microgravity, comes in handy for growing things that need to expand evenly in every direction or avoid the contamination of touching an enclosure's walls. Microgravity is of particular interest to people who create materials for miniaturized devices and computers, researchers told Space.com. "Demand for high-tech solutions requiring higher resolutions, faster processors, more bandwidth, greater precision, novel materials, unique alloys, innovative processes, higher energy efficiency, more processes in a smaller volume and more sophisticated tools in general are pushing materials and processes for manufacturing to the point that defects at the atomic- and molecular-level matter," said Lynn Harper, the lead of integrative studies for the Space Portal partnerships office at NASA's Ames Research Center in California. Building in microgravity can reduce those defects. The first major candidate for making money on something made in space today, a special type of fiber-optic cable called ZBLAN, is a good example: When manufactured in microgravity, the thin cable is less likely to develop tiny crystals that increase signal loss. When built without those flaws, the cable can be orders of magnitude better at transmitting light over long distances, such as for telecommunications, lasers and high-speed internet. "One of the challenges for making money from space manufacturing is, it's still quite expensive to launch things to space," Alex MacDonald, senior economic adviser within NASA Headquarters' Office of the Administrator, told Space.com. "You're still dealing with thousands of dollars per kilogram. So, whatever you are going to be making in space that you're going to be sending down to Earth has to be incredibly valuable but also available per unit of mass." "The reason they're doing this is the huge payout, which would be in billions of dollars if you can actually draw the fiber at least an order of magnitude better than silica," Dennis Tucker, a materials scientist at NASA's Marshall Space Flight Center in Alabama who has researched ZBLAN glass for decades, told Space.com. "There's a lot of potential applications if we can do this. Fiber amplifiers, there's lasers for cutting, drilling and surgery … infrared imaging, remote IR." "I'd just like it to turn into the first real space-based industry," he added. As the cost of sending things to space continues to decrease, experimenters can envision a number of other scenarios in which the space station environment could be key to manufacturing. For instance, a substance called gallium nitride, used to make LEDs, is difficult to solidify in large amounts at a time because its two constituent molecules don't always bind perfectly in order, leading to defects. Reducing the movement of the melted fluid as hotter and less-dense fluid rises, which occurs because of gravity, can decrease those defects — as can preventing the highly reactive substance from touching the sides of its container, according to Randy Giles, chief scientist at the Center for the Advancement of Science in Space. Someday, substances like that could benefit from in-space creation. The Electrostatic Levitation Furnace, a device that the Japan Aerospace Exploration Agency operates on the space station, is an example of the kind of setup that could avoid a container altogether, Giles said. The furnace can melt and solidify materials while levitating them in place using electrodes. As Rush put it, "If you have a piece of lint in your computer chip, it's not going to work very well." Microgravity offers a promising environment for manufacturing, as it's free from the stirring of convection that sinks heavier material down through a solution. 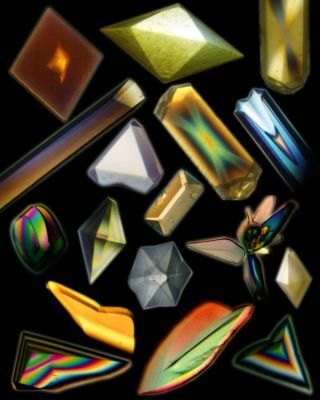 In microgravity, crystals can grow larger; in one experiment, crystals made from proteins grew to be 6 cubic millimeters, on average, compared with 0.5 cubic millimeters here on Earth. Once grown, those crystals can be analyzed to determine the proteins' 3D structures, which can help inform new strategies for drug discovery. Growing other crystals, like those used to manufacture drugs or those that can detect gamma-rays and neutrons, in space so that they're bigger and purer can make the resulting material higher-quality. The same holds true for metals. While metals made from a single element, like iron, can be useful, they can gain strength, flexibility or other special features when they incorporate other elements. For example, integrating carbon, and small amounts of other metals, with iron creates the much stronger and harder steel. Metals that are a combination of elements are called alloys, and some can form only in a low-gravity environment. "Because you don't have stratification as a result of density differences — heavy stuff doesn't sink to the bottom, and light stuff [doesn't] go up to the top — you can create alloys that are a homogenous blend of metals or minerals that would not ordinarily be able to be manufactured in as large a size on the ground," Harper said. "And, in fact, you may have some unique ones that wouldn't produce an alloy under any conditions on the ground." Metallic glasses don't get brittle in extreme cold, and so could make good materials for the gears of robots operating on icy planets or in space. Because materials in microgravity don't crystallize as quickly — such as the ZBLAN cable — you can even coax substances such as metal into amorphous, glass-like forms. Those metallic glasses can be molded at lower temperatures than ordinary metals can, and their noncrystallized structure makes them extra strong and resistant to corrosion. (A metallic glass called Liquidmetal — developed by NASA's Jet Propulsion Laboratory, the U.S. Department of Energy and the California Institute of Technology — mixes three or more metals to gain twice the strength of titanium.) While some metal alloys and glasses can be made on Earth, others can be developed — in large quantities, at least — only in the embrace of microgravity. Such alloys and metallic glasses could someday form strong, easily molded spacecraft debris shields, paneling, mirrors and more, as well as contribute to manufacturing on Earth, experts say. Space provides this strange, double-edged construction zone: It lets researchers test out materials to see how they withstand a harsh environment with powerful radiation and extreme temperature changes, but it also provides a particularly calm locale, gravity-wise, compared with Earth. "Space as we know it is focused on being a resource; it gives us GPS communications and Earth observation, the valuable commodity that comes back in digital form: data," Giles told Space.com. "Whereas the materials experiments that are done in the microgravity environment [are] bringing data back that allows and informs people of the materials' behaviors and properties as it may be important for space applications, it also is kind of like a severe shake-and-bake test that can be done on materials that will have Earth applications. "Also, by removing the convection, buoyancy and sedimentation, materials that you bring back can be like your gold standard to which you compare and determine how feasible it is to get a certain desired property," he added. Humans don't fare well in space over time, but it might be an ideal place to grow parts of them — organs, that is. Cells can grow into larger networks without gravity pulling them down into their container as would happen on Earth. "The idea of how microgravity can help cells grow has been around for a long time; in fact, one of the dominant tools that medical pharmaceutical research uses today, the rotating wall vessel, was actually developed as part of an '80s space shuttle effort at NASA," MacDonald said. That vessel was developed to simulate an aspect of microgravity on Earth by continuously rotating at just the right speed to counter a substance's slow sedimentation down through a nutrient solution. "The cells aren't smart, but they're adaptable," Harper said. "And if they touch a side or a surface, it gives them a message that's biologically misleading." Tumor cells growing on microcarrier beads in a NASA bioreactor on Earth were able to grow in three dimensions over the course of 56 days because of their container's rotating walls. Growing cells in space offers a similar benefit. While it's certainly more speculative, this is actually another plausible reason for private companies to get into the space industry, MacDonald said. "Organs, of course, are incredibly high-value, both in their ability to save life, but also their cost in terms of the medical economy," MacDonald said. "You've started to see companies start to experiment — so far, not on the space station, but on parabolic flights." It's hard to imagine routinely growing organs in space, but that's one of many possible money-making avenues as it becomes less expensive to put things in orbit. "We know that we don't know all the applications of the space environment for product development, material processing, product finishing," Rush said. "And we haven't explored it; we haven't plumbed the depths of the possibilities there, because of lack of access and high cost. But now we're kind of turning the corner on that. I think it's a very, very exciting time to be really exploring that." The company Alpha Space recently sent the MISSE-FF platform to the International Space Station to test different materials' durability when faced with the harshness of space. Another source of excitement for in-space manufacturing is building things for space that will never be constrained by the pull of Earth's gravity — or the crushing push of a rocket launch. The International Space Station already harbors 3D printers, which Made In Space has used to produce tools right on the space station. But the company's vision is much grander: Large-scale structures, like space telescopes or solar panels, could be printed in space instead of being folded up to launch into orbit. And visitors to other worlds could someday use the resources locally available to print shelters and other components, traveling only with the digital blueprints. Building in space will require a sound understanding of how materials react in space and how to get raw materials, as well as a rethinking of what can be used in a 3D printer or as the basis for space-made materials, researchers told Space.com. "To me, the exciting part is looking at everything around me as potential feedstock to make new stuff, and that mindset and that paradigm shift has huge implications," Niki Werkheiser, NASA's in-space manufacturing manager, told Space.com. "Whether it be in situ resources, our food, foam, plastic bags, whatever's around us, I'll look at that as, how can I reuse or recycle? And it does require combining and understanding not only the machine's capabilities, but the materials' qualities and properties for what you need to make." But whether microgravity-based materials research looks into building for Earth or for space, this area of investigation is making strange and wonderful things that have never been seen on the ground at those quantities or of that quality. "There's so much potential to do things in this area now that we weren't able to do before, and it's not just dreams and ideas now — it's happening," MacDonald said. "There are facilities on orbit that you can use and you can think about improving, and you can think about developing your own facilities. It's a little like small satellites were 10 years ago. People could see that it was very exciting, and we were beginning to do experiments, but I think the really exciting stuff is still to come."